I’m a big fan of all the romance genres, so was excited to dive into this anthology, and I wasn’t disappointed. In Playing for Keeps by Mary Blayney I found a really fun mystery/romance. There was a lot of cute back and forth between the hero and heroine. I smiled a lot while reading this story. The two of them were trying to find out who was trying to frighten people, and why was it being done. A lot was put into this short story and I enjoyed it very much. Next came The Princess and the Pinot by Elaine Fox, a sweet romance with a lot of fun twists and turns. This author managed to put a lot of detail into this short story, and really engaged me. I thoroughly enjoyed the word play between the hero and heroine. Also enjoyed the gnome (or fairy godfather) in the story. A neat idea, well executed. The third story was Duets by Emelle Gamble. This story, though exceptionally well written, felt a tad out of place amongst the rest which were very clearly romances. This was a very intriguing and somewhat sad story. A story of lovers separated by fate. 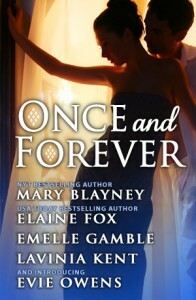 When they meet again, sparks fly, but this story is not a fairy tale romance. This is more like real life, and made my heart hurt a little. Then I moved on to Never and Forever by Lavinia Kent, a touching regency romance. This story really explains how differently all the people in those days were expected to behave and live. A very interesting, very proficiently written sweet story that touched my heart. Lastly I read The Psychic Detective by Evie Owens to get my paranormal fix. It’s a really unique ghostly novella as well as a tender romance and may have been my favorite story in the series (tough to decide since I enjoyed them all). Ms. Owens wrote about the heroine and hero so well, I felt that I knew them both almost at once. The ghosts in the story are delightful and the mystery was very important to the story. Just reviewing it makes me want to go read it again. If you, like me, enjoy your romance in all genres, I highly recommend this anthology. It’s a great way to get a taste of everything you enjoy.